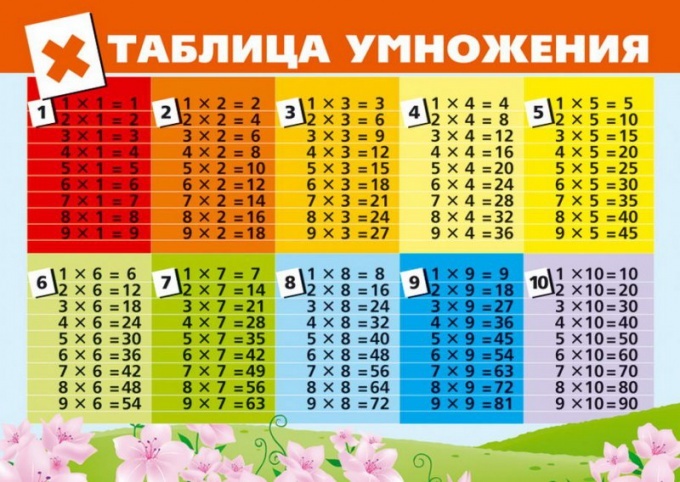 To learn the table of multiplication, before the eyes need to have an example where in an understandable and accessible form will be seen every combination of numbers. To create a multiplication table in Excel, you'll be able to print any columns or rows in the table to the optimal size. First do the top row of numbers. To do this, in the second cell of the first row B1 write the number 2. In the next cell C1 add the formula, i.e. write "=B1+1" (without quotes) and press Enter. You will see that the program itself will calculate the value of that cell, and it appears the number 3. Not to write the formula every time, hover over the lower right corner of cell C1 and hold the left mouse button pressed, drag it to several cells to the right (to get the multiplication table from 2 to 9 – 6 cells). Similarly, make a vertical row of numbers. In cell A2 write the number 2, cell A3 the formula "=A2+1", then drag the formula to more cells down. Start to fill the center of the table with the first column. To do this, write in the cell B2 the formula "=$a$1*A2" or simply "=2*A2". Then, grasping the box the x in the lower right corner will distribute the formula to all the cells below. Check all the numbers column must be multiplied by 2. Similarly fill in the other columns: with the top cell, write the formula that multiplies the number specified in the column heading for the row title. In order not to type the name of the cells manually every time, you can do the following: write in a cell " = " number, the multiplication sign, and then the mouse specify the cell whose value is to be multiplied by this number. When the base table is ready, align the column width. To do this, select all columns of the table, not by clicking on the cell, and the letters indicating the column number (the columns should be allocated entirely). Place your mouse cursor on the line separating the columns (also at the level of letter symbols), you will see how he will turn into double arrow. Then drag it right or left, the width of all columns, this changes. Similarly, change the row height. In order not to confuse the column and row headings with the results, select the desired cells and using the formatting toolbar or menu item, right-click "Format cells" to change the size, color, font, fill the entire cell as a whole. You can make this cell larger than the others. If you are table to print in the printer settings, locate the "page setup" and adjust the scale to score the multiplication table was on the sheet in the desired size.